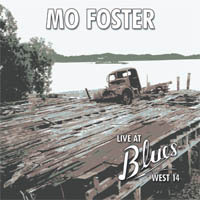 “Live At Blues West 14” is proof of how correct that statement is. Most of the tracks on this album were recorded live in small clubs in the 90’s and the majority were recorded at Blues West 14, a small basement club in Kensington, London Classic Jazz / Fusion / Rock performed by masters of their profession. The music is a gentle and easy mix of blues and jazz, the sort of music you'd listen to over dinner, where it fits in well. Lovely fretless bass, timeless piano, sweet saxophone - the tracks meander soothingly...Do yourself a favour and chill out for an hour. Beginning with its uptempo bass and guitar riffs, "The Importance Of Being Invoiced" is pure jazz-rock fusion, and its deft, energetic playing elicits vigorous applause in the intimate setting; the clever title refers to the working musician's difficulty getting paid. "Hot Buttered Cats" has a silky jazz/R&B feel, dynamically building off Foster's bass guitar lines. Foster earns songwriting credits on 10 compositions, including "Oh No," a challenging jazz piece that moves through several variations, and "Tradewinds," a catchy tune brightened by the Caribbean percussion background. ...displays a rare breadth and imagination in both the choice of material and the skill in which it is delivered...the atmospheric jazz fills the air and carries you away to a better place...Class throughout.